The movement of thousands of negatively charged atomic particles—electrons—makes modern electronics tick. Yet, ubiquitous as electrons are, the particulars of their behavior continue to stump physicists. One phenomenon has proven especially puzzling: how electrons move under the influence of polarized electromagnetic waves. Polarization occurs when waves, such as electromagnetic or light waves, rotate. Electromagnetic fields called microwaves have a rotating electric field that turns clockwise or counter-clockwise, and most theories predict that microwaves will affect the rotation of electrons. And yet, experimental studies have shown that electrons seem to be unaffected by microwave polarization. These theory-defying results have long perplexed physicists. A new study by researchers at the Okinawa Institute of Science and Technology Graduate University (OIST) may explain this disparity. In the work, the OIST researchers measured electrical current across a two-dimensional plane. By changing the polarization of microwaves, the researchers were able to show that polarization does indeed affect the electrons’ motion. Their findings were published in Physical Review Letters. “It is natural to expect that the effect will be strongest when both electrons and microwave fields rotate in the same direction, and will be strongly reduced when the directions of their rotation is opposite,” said Denis Konstantinov, senior author on that paper and head of OIST’s Quantum Dynamics Unit. That is indeed what Konstantinov and his team found. Denis Konstantinov (left) and Oleksiy Zadorozhko (right), from OIST’s Quantum Dynamics Unit, standing in front of the equipment they used in their experiments. The team from OIST collaborated on the study with researchers at the Institute of Low Temperature Physics and Engineering in Ukraine. While a colleague in Ukraine developed a mathematical framework to test leading theories within the researchers’ framework, scientists at OIST tested them experimentally. 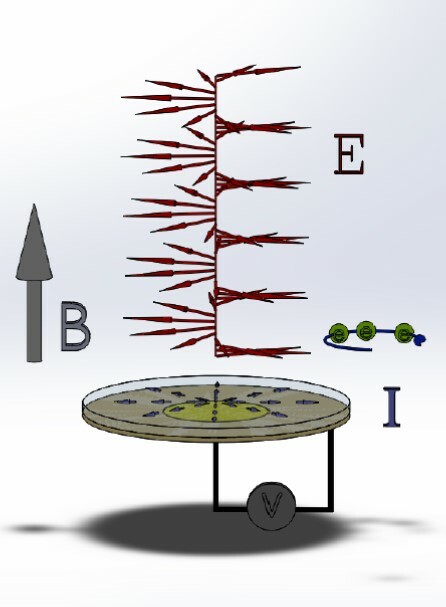 Schematic representation of the experiment. A rotating microwave field (E) is sent through a circular layer of electrons while their electrical current (I) is measured by applying voltage (V). In previous experiments, the electrons’ movement was studied in solid-state materials such as semiconductors. But these materials contain impurities that are impossible to eliminate and that can interfere with results. So the researchers created a system that closely mimics the function of a semiconductor by using liquid helium. It consists of electrons on the surface of liquid helium enclosed in a vacuum chamber and cooled to temperatures close to absolute zero—roughly -273 Celsius. Helium possesses a unique ability: it remains a liquid, even in temperatures reaching absolute zero. Meanwhile, any other compounds (impurities within the helium) freeze, clinging to the walls of its container. At such low temperature, the electrons at the helium’s surface become “quantized”—the motion of electrons perpendicular to the liquid is “frozen out” into a two-dimensional space, said Konstantinov. Custom-designed vacuum chamber that contains electrons above the condensed helium. The microwaves are introduced into the chamber through a waveguide and focused onto the electrons by a spherical mirror. 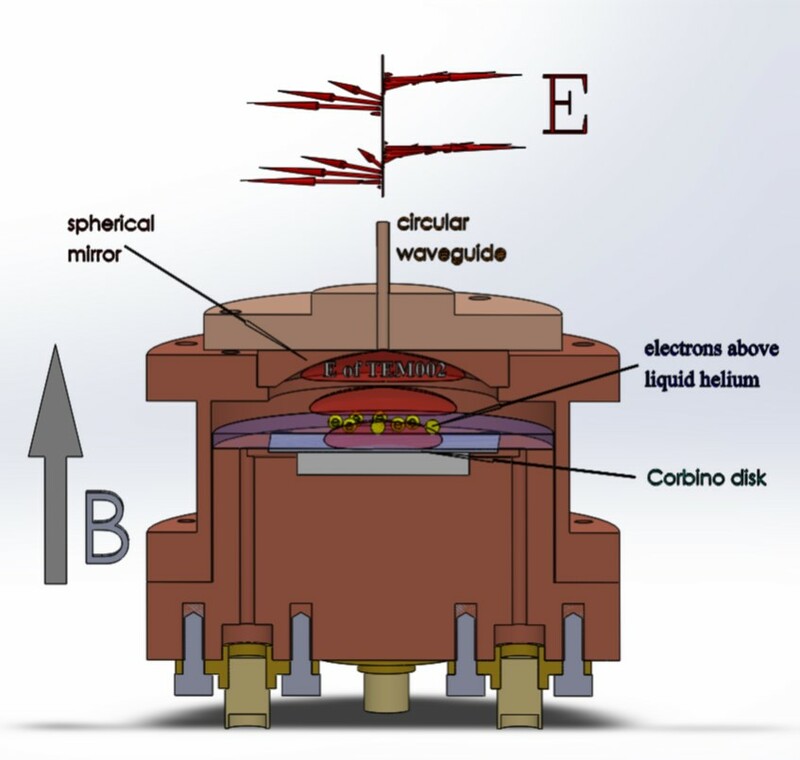 In this system, when the researchers sent circular-polarized microwaves down through this layer of electrons and induced the electrons to rotate in the same direction as the rotation of microwave field, the measured current of electrons started oscillating with the applied magnetic field. When they reversed the rotation of electrons by switching the direction of magnetic field, the oscillation significantly weakened. The researchers observed the same behavior by reversing the direction of rotation of the microwave field while keeping rotation of the electrons unchanged. The color plot represents the current of electrons as the magnetic field and frequency of microwaves is varied. The white line highlights the strong dependence of the current on the direction of the magnetic field. That means that electrons are indeed affected by polarization of these electromagnetic waves. Still, more work remains to be done to understand why exactly these particles behave the way they do, said Oleksiy Zadorozhko, first author on the paper and a postdoctoral researcher at OIST.